It was an overseas school trip with a difference. 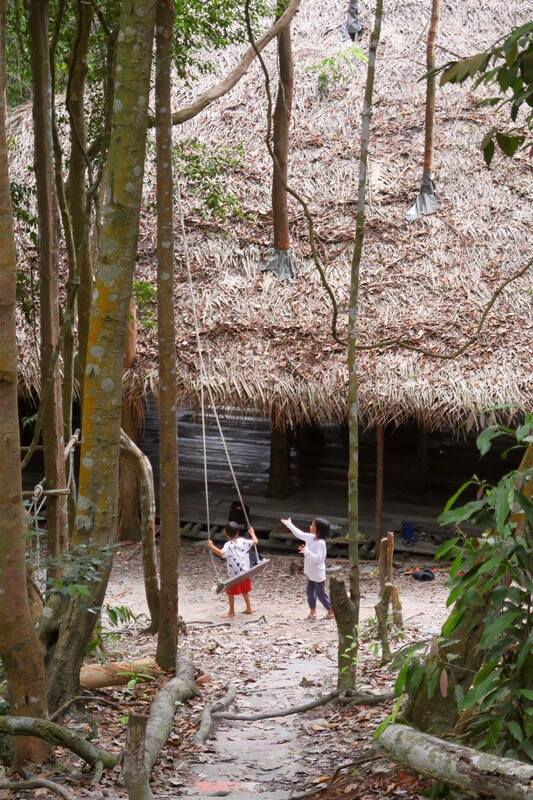 The children, all 21 of them, awoke eagerly as they made their way to the campsite, some 80 kilometres away. 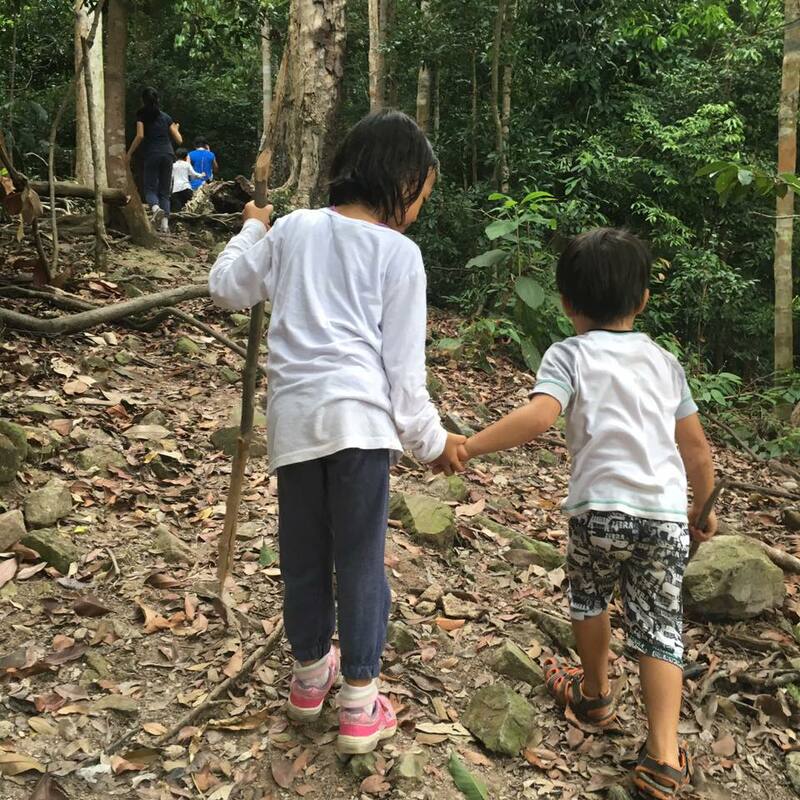 There were no complaints despite the long road trip; nor were there any hesitations as the young ones trudged up the final 300 steps to their destination. And the teachers maintained half a smile on their faces, even as they carried their heavy backpacks, and negotiated all 300 of the winding, undulating steps. 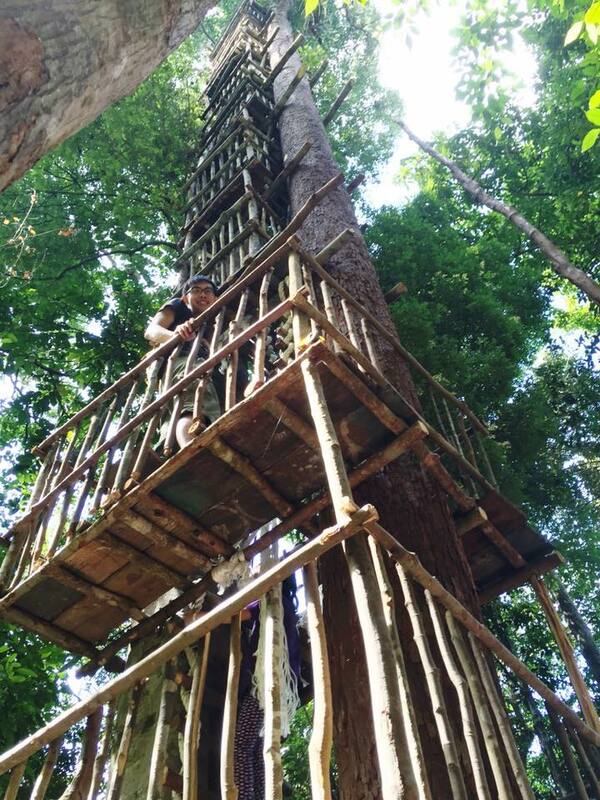 This was the beginning of an exciting 3-day, 2-night Treehouse Adventure in the rainforests of Gunung Pulai in Johor, Malaysia. 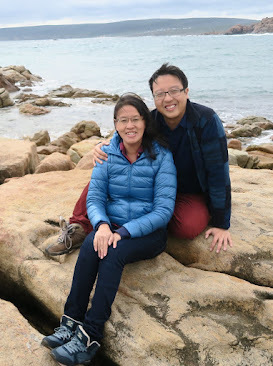 And the group was no ordinary school; it comprised 10 families from the Homeschool Singapore Facebook Group, with teacher-parents guiding their children, of ages 3 all the way to 16. Our lovely treehouse abode for the 3-Day, 2 Night Adventure. 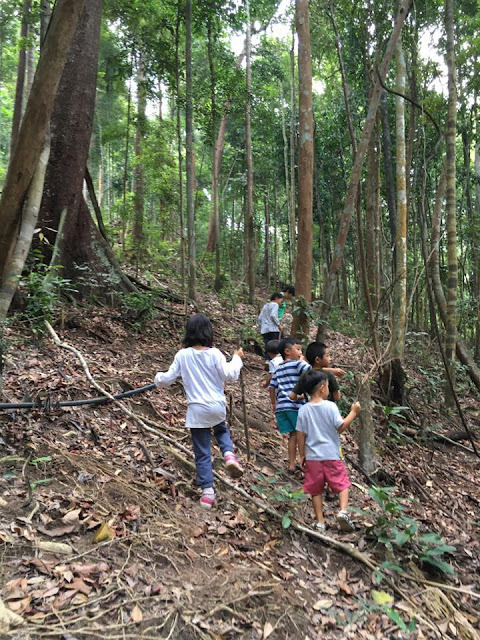 The premise of the adventure was simple; for families to get back to the basics and enjoy what nature has to offer. 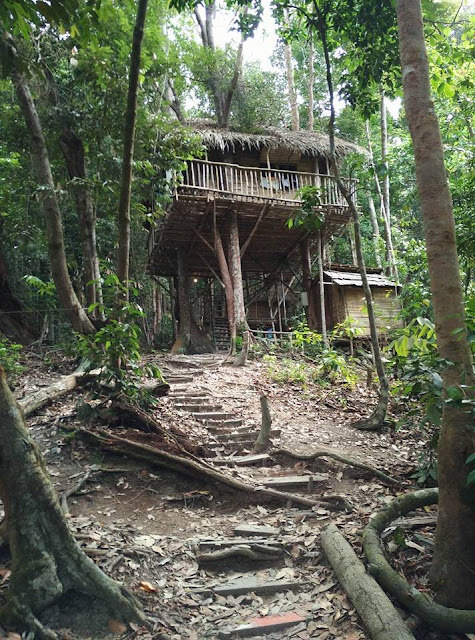 We were to stay in a treehouse, fashioned from solid wood, and built on living trees. The floorboards were made of bamboo; while the rooftops pieced together from attap leaves. There were mosquito nets, and we had the option of sleeping on mattresses and pillows. 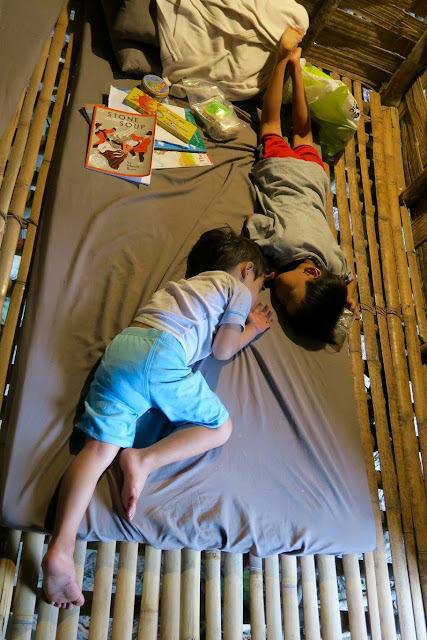 But if we chose to sleep on the bamboo floor, there were gaps between each bamboo floorboard to help in the ventilation of the treehouse and to keep body temperatures down. High ceilings. 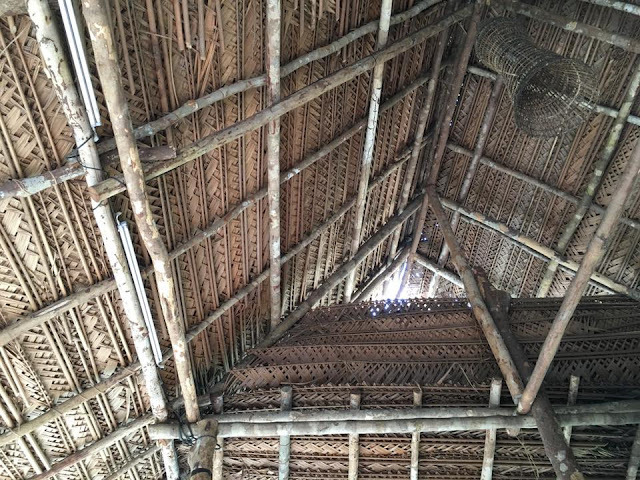 Each structure is made from natural materials with much ventilation. allowed for much ventilation and it was really cool in the treehouse. The steps of the treehouse were made of bamboo too. 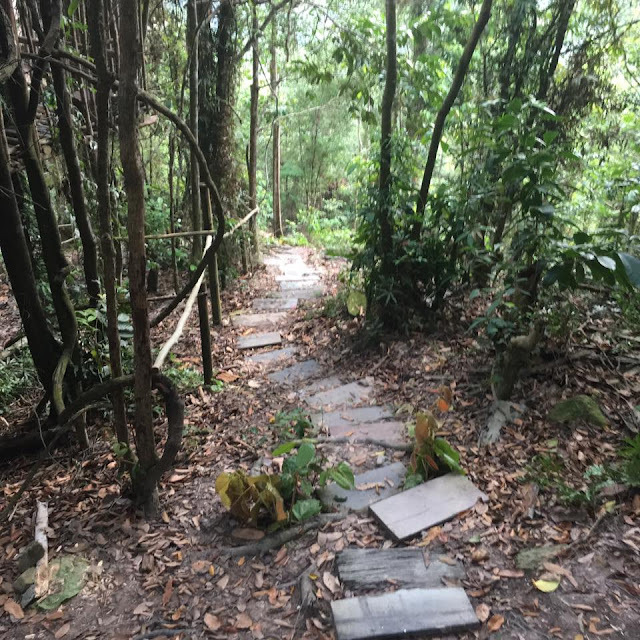 This meant that if you decided to use the restroom in the middle of the night, you would have to make your way down in the still of the night; down the thin bamboo steps, and into the nearby "outhouse", which was thankfully equipped with a regular flushing system. Baths were also taken in the outdoor restroom, and if you're thinking of a hot shower, that's a notion you would have to leave at home; although the idea of a cool shower with water channeled from the nearby stream might rejuvenate your senses! 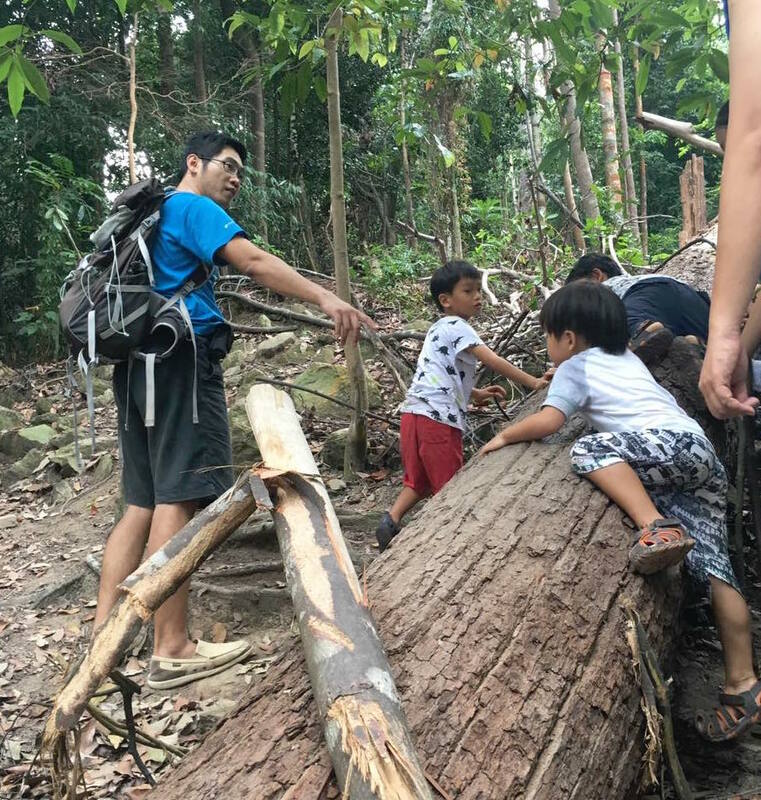 Yao, the owner of the property, shared that he built the place with the intention of helping city folk enjoy a "back to nature" environment. In fact, it took the local Orang Asli a good nine months before the entire place was built, and the materials used in the construction were all taken from nearby sources. 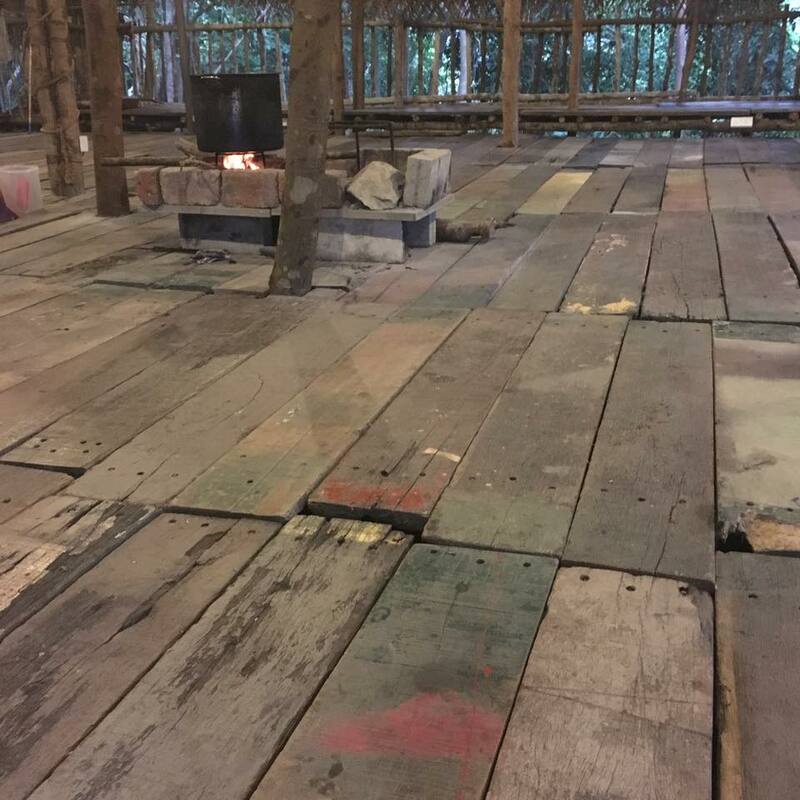 For instance the wooden boards in our large dining hall actually came from decommissioned ships in Singapore! Our dining hall. Note that the wooden boards here used to sail the seas as parts of a boat! 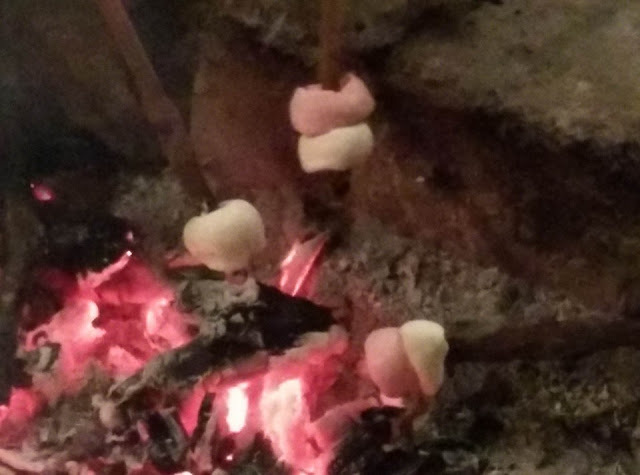 wood-powered fire. 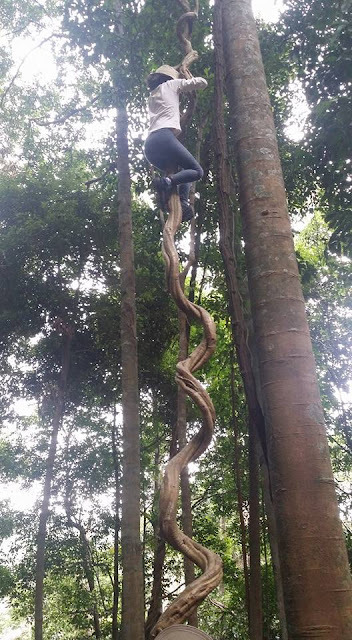 Photo Credit: Eve Sam. We led a simple life those three days; with nasi lemak for breakfast, fried bee hoon for lunch, and hotpot vegetarian ee mee for dinner. We were surprised that the ash from the open fires were used to wash plates, and that these produced sparklingly clean dishes! Through it all, the kids were happy; happy to trek to the nearby waterfall and splash around in its cool clear waters; happy to embark on a rather arduous three-hour hike up the mountain (with an average 45-degree incline); happy to scale the massive watchtower; and most of all happy to just enjoy the facilities that the place had to offer - swings, giants hammocks and a breath of fresh air. The Lord of the Rings. Photo Credit: Candy Tay. 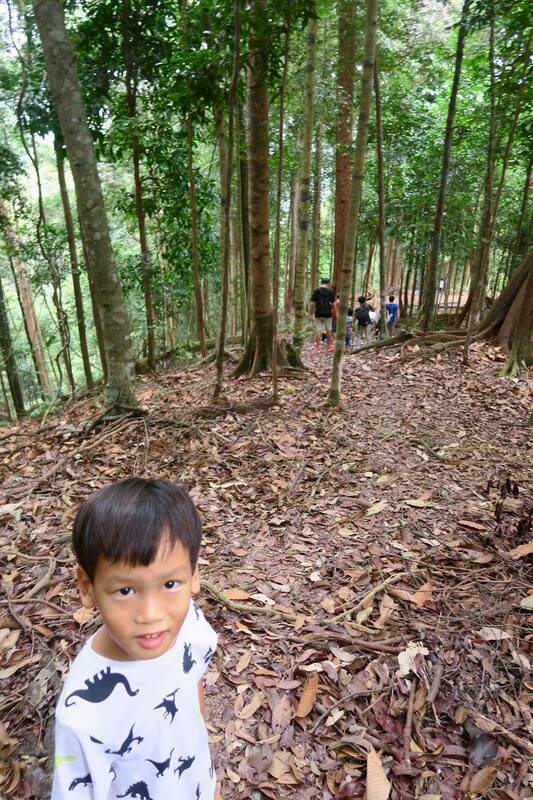 Our almost-6yo Z was clearly in his element during the hikes. Kids were clearly enjoying the hike. No whining. No complaints. 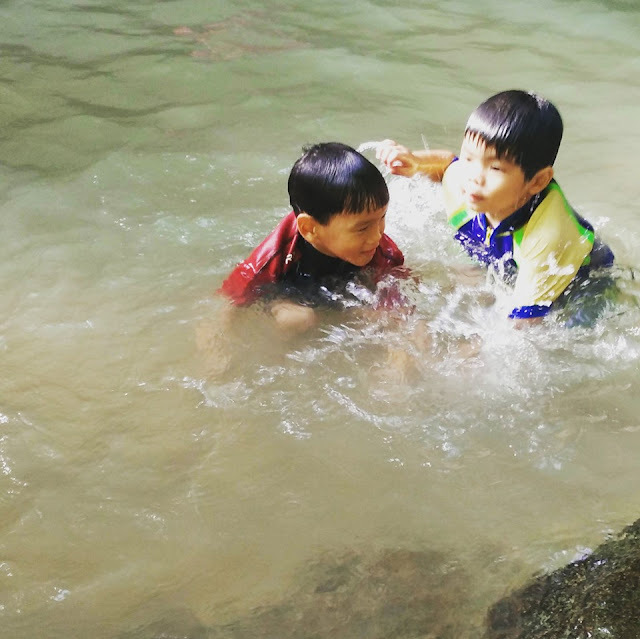 The "Water Brothers" enjoying a lovely dip in the nearby waterfall. Throughout the entire 3-day trip I did not see a single child glued to his or her electronic iPad; neither did I observe a family of parents seated at dinnertime, with their smart phones wedged in their hands. 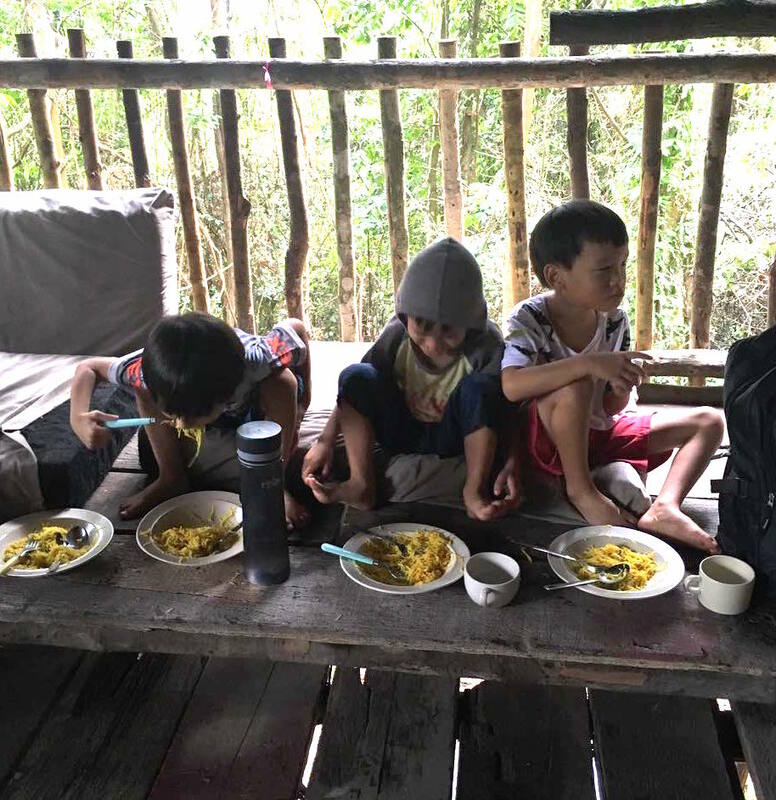 Instead I saw children helping themselves to the food, before seeking out their friends to enjoy meals with. And parents were free to enjoy the company of other adults, knowing that their kids were nearby, engaged in healthy and safe activities. Indeed one of the highlights for the kids must have been when one of the parents took out a packet of marshmallows, and the children were then seen huddled around the dinner fire, grilling their little wooden sticks of delectable delights. Our almost-4yo son E found a "Sister" to take care of him. Firm friendships are forged in such natural scenarios. I'm not sure if I can live such a life on a regular basis. We have to acknowledge that we are living in a modern era, and that life as we know it cannot be as it was in the past. Some of us may have romantic notions of living in an historical era, or others may wish that certain modern innovations were never invented. However we have to face reality. How do we parent our children in a modern era where we may not necessarily agree with whatever that we see that's happening around us? I believe the answer is in our principles and in our values. If we bring up our children in alignment with strongly positive principles and values, they will themselves be more likely to lead their lives on the basis of these fundamentals. For at the end of the day, it is not only a simple life that we are looking for in the physical sense, but a simple life in the emotional and even spiritual dimensions. Family games led by the Ong family. 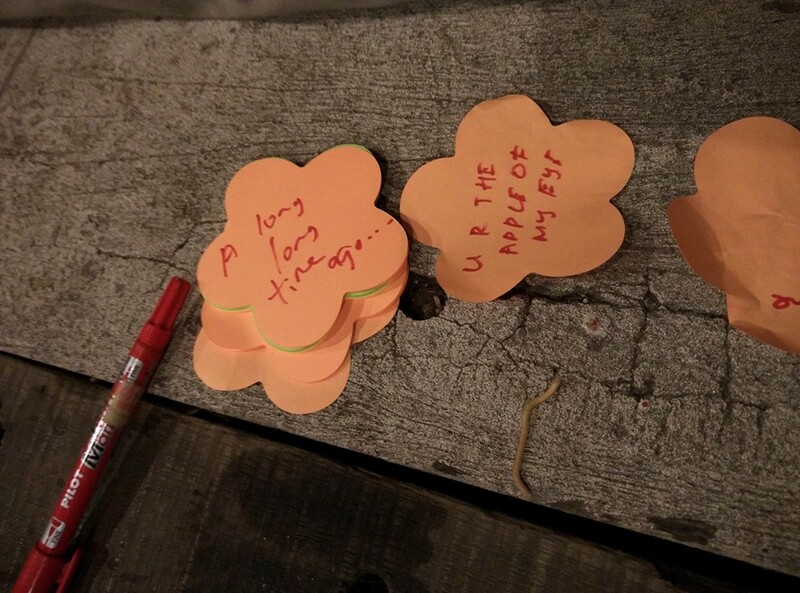 This was our answer to the question: "What do your children hear you say the most?"